Elvis Presley died on this date in 1977. STAR WARS was released earlier that summer. So the big pop culture question is: did Elvis see STAR WARS? Sadly, the answer from every source is no, he didn’t, but he wanted to. The day before he passed he was trying to obtain a print of the movie so he could watch it with his daughter, Lisa Marie. 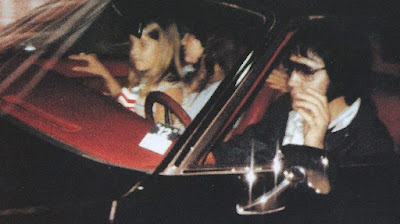 Three days before that, he had taken her, and his girlfriend Ginger Alden to see the then latest James Bond movie, THE SPY WHO LOVED ME, the last film he saw at the cinema (the picture above is of them in his 1973 Stutz Blackhawk III coming back from the movie). As far back as 2005, the site everything2.com, also speculated about it, and pondered if the movie’s director, George Lucas, ever saw Presley in concert. It’s too bad that one of the biggest films of all time wasn’t seen by one of the biggest performers of all time. I, of course, can’t (or don’t want to) speculate on whether if it would’ve saved him, but I bet he would’ve loved it.